That’s right. I’m a judgey judgerson. Don’t be all nervous. I am not judging you. right now. Chances are I did though. When I first met you or read your blog or emailed with you or read a comment you left. Some people call it “first impressions”. That is just a nice way of saying “judged”. I think we all do it, am I wrong? I mean, I fairly certain my brain is hardwired to make a judgment the first time I “meet” someone. Isn’t everyone’s? We all know how I judged every person in the Olive Garden a couple weeks ago. And as many of you said in the comments, it’s all about making first impressions. I started thinking about that, and I realized that I judge everyone and everything…at least once. And I have been beating myself up over it. For example, this morning I went to Shoe Carnival to get myself some cute black shoes to go with the outfit I want to wear tonight to Cort’s cousin’s wedding. I judged everyone in there on what they were wearing. I immediately put it out of my head (because I am not a total jerk), but for a split second, my mind took in what they had on, what kind of shoe they were looking at, and even how their kids were acting. Admittedly, the woman with the tatrumy toddler? I gave her the “oh honey…you are so brave” look. But my FIRST thought? “Ugg…screaming kid” because I had just left one of those at home. And I know people were judging me too. I have a zit colony the size of DC on my jowl chin and I hadn’t done my hair except for a messy bun. I was wearing an old hoodie (in an attempt to be bulky enough in the collar to cover up my zit colony) and blow out boots (yes, I bought new boots). If I saw me? My first thought probably would have been, “it’s Saturday, not Slopperday” and then I would have immediately dismissed it. But I left the house that way anyway. Because hopefully, people are like me, they judge and dismiss…unless given a reason not to. I know people who are all like, “I totally withhold ALL judgment until I get to know a person,” and I have to call BS on that. How can you not make SOME sort of immediate judgment when you first encounter someone either in person or in the blog world? We size up what someone is wearing. We hear the way they talk…the words they choose. We know what they choose to share. I think because I know I do this, I am assuming everyone else does too. That is probably why it is a very rare thing for me to be caught shopping in my pajamas. Yoga pants and sweat shirt, sure, but not my jammies and slippers. I am also conscious of it on my blog. Sure I write for me. But to say I ONLY write for me is a total lie. I write for you too. I like you. I like what you have to say. So I think about YOU when I write. Because I know blogging is a fickle place. If I visit a blog for the first time and I am overwhelmed with ads or widgets in the side bars or music is blasted at me or if the content is hard to read or if the content is boring…I am probably not coming back. And I know you are that way too. It’s how we know we like someone or don’t. It’s how we decide to follow a blog or not. It’s the reason first impressions are important. Because I the world is judging. Now pardon me…I have a zit colony to expunge. I don’t mean to sound like all judging results in negative decisions. We judge things based on what we see/read/hear, but then we make decisions based on those judgments. Not everyone that I “judge” is deemed a bad person/mom. Most of the time it’s just the opposite. In fact, unless you prove you’re not wonderful, I judge that you probably are! I agree! Great post! I found you on Twitter, well, follow you on Twitter and clicked over. I think we all like to think we are more open minded than we are, and really, some of us are. BUT, we do have initial judgements and it’s from there we form actions and create our worlds. I judge too! But, I like to think I still leave others room to pull themselves up or down from that judgement. Blogging is so hard in that matter. Not everyone is going to like your blog. That’s fine, too. But of course we ALL want to be liked. That is why there are ways to know which blogs attract more attention. I’ve read all sorts of blogs on this. There are big no’s and then there are preferences. Yup, I agree. We all make initial judgments. soooo true. even when driving to work i judge. i judge the dude that just cut me off… but when i cut someone off, i make an excuse that “i’m late” or “it’s been a long day”… maybe i don’t know their story. instead, i yell at them. we do it. but the question is whether we act on it or let it stay with us. when i see a mom with a screaming toddler, i do the same… for a split second “control your child, woman!” then i think… I’ve been there. and i flash her a quick smile, saying, it’s ok.
Yep, hands up, I judge too. Sometimes it’s just pure gut instinct, and sometimes I’m wrong. It’s funny, but having a child with special needs has made me stop and think more about everyone. You never know what someone else’s life is like. I admit, I judge. I think we have to if we want to know if a person (or blog) is right for us. But I will also admit, that my judgments aren’t always the right ones. If they were, I never wold have marries my husband. Sometimes I think maybe we aren’t so much as judging people as just making observations. And possibly comparing ourselves just a bit (which I’m guilty of when out shopping). But I do like what you’ve hit on here, and it kind of ties in with a post that’s been stewing around in my head. We’ll see if it gets out or not! It’s intention. You are clearly full of good intentions. I think you’re also hitting on instincts, which has less to do with conscious judgment and more subconscious stuff. This post is like an onion. Or an ogre. It has layers! p.s. Think good judgments about me on Monday when I have my surgery, ‘kay? Trust me when I say that I know what it’s like to be judged on first impressions. 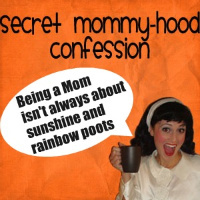 I’m quite sure that a lot of the mommy bloggers run screaming from my blog when they see my Tagline. However, I try to use that in a positive way by telling myself it’s a reminder that I am different and can’t expect to be accepted into every fold. I’m just very outgoing and love people and have no hidden agenda, as some others might think. I’m not saying I don’t judge, because of course I do. I just try to think my judgments through. And that doesn’t always work either. I am happy to say that I have an open mind and I enjoy blogs from people of both sexes, and lots of different age groups and backgrounds, vocations and interests. And I’m proud to say that my regular followers feel pretty much the same way. This was a very good post. Love the “judgey judgerson”. Very true! I think judging is perfectly normal, it’s the dismissing that judgement until you’ve got more of an impression that is important. It’s also those first judgements that help keep us safe. Those “Something’s not quite right about this person/situation” feelings are judgements and usually good ones too! My mom always taught me to not judge a person because of the way they dress etc. Sure, all moms do. But for some reason it stuck with me because my mom had a lot of medical issues when she was growing up and got made fun of. So I think that I consciously think about what she went through. Now I’m not a saint. I judge just as much as the next person. However I do give people a chance. I do believ the good in people and that what they wear or how they walk or do their hair is not an indication of who they are. I also used to belong in a social group that cared very much about appearances and would talk a lot of smack about others even if they didn’t know them. I hated it and the things they said. You’re right, we all do it. But what counts, IMHO, is what we do with that judgment. If you use your judgment to spread rumors, slander people, or bully people-then you’ve crossed a bad line. I do it, all the time. And I do often feel badly about it, because you never know what’s going on with someone on any given day, at any given time. I’m sure people make a zillion and one judgments about me, too. As you mentioned, they get dismissed right away – at least, the ones I make do. This *so* made me laugh. A lot. I’m sure you weren’t trying to be funny when you wrote this, but I just can’t help buy relate to everything you said. You know, I was thinking about this today. Blogging has shown me that there is something good in everyone, even if first impressions say no. Know what I mean?